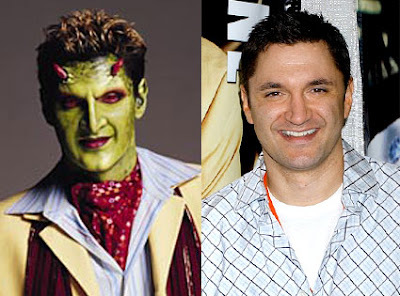 Andy Hallett, who Whedon fans know as the actor who played "The Host" a.k.a. Lorne a.k.a. Krevlornswath of the Deathwok Clan on Angel (from season two on) just died of heart failure at the really appallingly young age of 33. He added a really astonishing amount to the show, and was fabulous throughout. It's really a terrible loss, even far beyond his family and friends, who must be devastated. When I was a kid, I remember hearing that cockroaches would not only survive the sure-to-happen US-Soviet nuclear holocaust, but actually emerge stronger than ever as they devour our irradiated corpses. Similarly, there’s a new think tank in town, headed by Bill Kristol, Robert Kagan, and former Coalition Provisional Authority spokesguy Dan Senor. File Under "Google is ! @#$%ing Awesome"
A google search for "Lilly Rosemary" -- just those two words -- brought up, first, a video of the Dylan song I was searching for. The fourth hit was a link to the lyrics on Dylan's official site; the fifth was to the song's wikipedia page. On blog-related matters: sorry for my recent radio silence. There is no reason except the main reason. I keep hoping that my life will return to a sufficient balance that I can blog somewhat more (I have a number of longer pieces I want to write when I find the time); but so far, no. (By this time last year, I'd put up 54 posts; so far this year, I've managed a third of that, and almost all of those have been quick links & quotes, rather than more substantial pieces.) I continue to hope things will change. 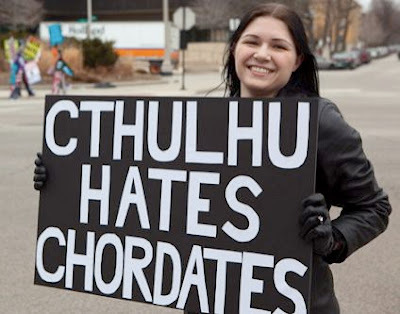 In the meantime, my apologies; and, as always, I invite you to browse the archives -- or the other fine blogs in my sidebar. ...Emerson just mentioned forcing conformity to overall attitude, but I swear that I somehow remembered him also specifically referring to schedules (and nap times in particular). Alcoa, the biggest aluminum company in the country, encountered two problems peculiar to Iceland when, in 2004, it set about erecting its giant smelting plant. The first was the so-called "hidden people" -- or, to put it more plainly, elves -- in whom some large number of Icelanders, steeped long and thoroughly in their rich folkloric culture, sincerely believe. Before Alcoa could build its smelter it had to defer to a government expert to scour the enclosed plant site and certify that no elves were on or under it. It was a delicate corporate situation, an Alcoa spokesman told me, because they had to pay hard cash to declare the site elf-free but, as he put it, "we couldn't as a company be in a position of acknowledging the existence of hidden people." Hilzoy adds: "Possibly the Icelandic banks should have made sure there were no hidden people lurking in their balance sheets, waiting to take revenge on anyone who disturbed them." One of my more neglected hobbies is comparing poetry translations. Because poetic translation is so over-constrained -- so that, in the words of Vladimir Nabokov, a rhymed translation that also "translate[s] the entire poem literally is mathematically impossible" -- any attempt to put it into a new tongue is going to involve contentious aesthetic choices. For that matter, the same is hardly less true of translation of unrhymed poetry: since poetry, practically by definition, involves playing with the specifics of its original language ("poetry is what's lost in translation" opines Robert Frost from off under his apple tree). So it's fun to see the different ways that people do it. Watching others attempt the impossible is always entertaining, which is why people go to circuses. For me, it's fun in particular with canonical heavyweights -- if only because lots of translations of them tend to exist. In times past, I've collected translations of, in particular, Goethe's Faust, but also (to a lesser extent) of the Odyssey, the Bible, and Dante's Divine Comedy. A word about the Onegin stanza. It's a cousin to a sonnet, although with some key differences. First of all, it's in tetrameter, not pentameter (four beats per line not five). Secondly, as opposed to either the traditional Petrarchian (ABBAABBACDECDE) or Shakespearean (ABABCDCDEFEFGG) rhyme schemes, the Onegin stanza uses one of its own (ABABCCDDEFFEGG) -- one which deliberately goes through the three possible variations on a rhymed quatrain (ABAB, CCDD, EFFE) with an additional couplet to close it off (GG). Finally, Pushkin alternates masculine and feminine rhymes (the former are rhymes which rhyme only one syllable -- head, dead -- and the latter are ones which rhyme more than one -- platter, clatter). Some English-language poetry has been written directly in Onegin stanzas, so you can get an idea of what it's like. First and foremost, Vikram Seth's absolutely delightful verse novel, The Golden Gate, is written entirely in Onegin stanzas, in a direct homage to Eugene Onegin (actually, to its 1977 translation by Charles Johnston); you can read some sample stanzas from it here, but they only give a taste -- you really ought to go read the whole thing. Then there's Nabokov's two-stanza poem "On Translating Eugene Onegin", also written directly in English in Onegin stanzas. Anyway, the point here is that it's a tight, tough little form. Hard to do. I had heard of Onegin before -- I'd taken a whole college class on Nabokov back in the day -- but what really turned me on to the existing English translations was reading Douglas Hofstadter's delightful (if often infuriating) book Le Ton Beau de Marot: In Praise of the Music of Language. He devotes two chapters two Onegin. One he devotes to praising and comparing four rhymed translations -- those of Oliver Elton (1937, later rev. by A. D. P. Briggs), Walter Arendt (1963, rev. 1978), Charles Johnston (1977), and above all that of James Falen (1990); the other he devotes to attacking the "vile non-verse" of Nabokov's deliberately ugly translation. And, much to my surprise as a self-identified Nabokov fan, Hofstadter won me over. ** I began collecting Onegin translations when I saw them. One of those eventually included that of Douglas Hofstadter himself (1999), who taught himself enough Russian to go at the task, so enamoured was he of the poem after his two-chapter gear-up in his earlier book. In the introduction he talks about all of the above-cited translations as well as his own, and also about the translation of Babette Deutsch (1936, rev. 1964) which he had read since the completion of his earlier book. In the first book, he gives four stanzas in each of the five translations (counting Nabokov) that he highlights; in the introduction to his own translation, he gives an additional stanza in seven (counting his own). Hofstadter, by the way, is still at it. If you scroll way down in this online talk of his (or simply search for the word "Deutsch") you'll find eight versions of Chapter 2, Stanza 38 (the original Russian and seven translations of it), which he quotes and discusses. But yesterday, while I was procrastinating on grading the papers I need to grade engaged in deep intellectual questing, I discovered that there are two new rhymed translations since Hofstadter's discussions were published: that of Tom Beck (2004) who, like Hofstadter, taught himself Russian for the task (sample stanzas here), and that of Stanley Mitchell (2008), which seems to be the most recent (chapter two is online in its entirety here). Since I happened to have on hand the first stanza of all of Hofstadter's seven translations -- plus a literal one Arndt did for a book called Pushkin Threefold, plus the Russian (of which I did not understand a word), I dug up the first stanzas of the Beck and Mitchell two, and thus had a complete set of ten versions to compare. Anyway, once again, here's a link to Nine different versions of a Eugene Onegin stanza in English (with a bonus couplet from another stanza tucked in at the end). I hope that at least some of you may find them half as fascinating as I do. I think that reading them can tell you a lot about translation, poetry, rich dying relatives, and other noteworthy things. Now, if you'll excuse me, I think I might have some papers to grade. Or something. Update: At the suggestion of several readers, I've added the 1881 translation of Henry Spalding (that link goes to the complete text on Project Gutenberg) -- not one of my favorites, but for completion's sake it's now there. * Which doesn't by itself prove Nabokov wrong, since he only said it was impossible to translate Onegin faithfully with rhymes preserved. ** For a good argument on the Nabokov side of the debate, see Brian Boyd's comparison of the Deutsch, Arndt, Johnston and Nabokov translations in the Onegin chapter of his biography Vladimir Nabokov: the American Years.